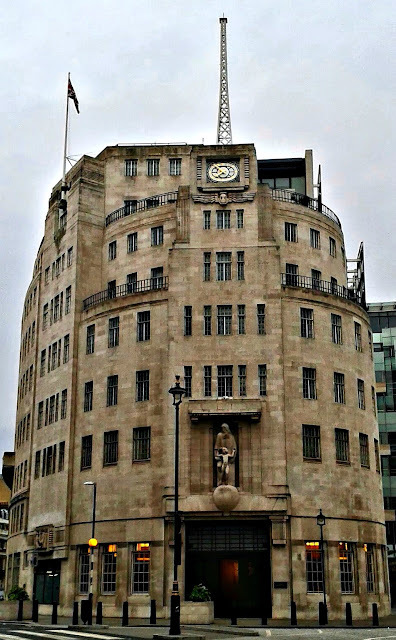 Construction of Broadcasting House began in 1928, with a steel frame being covered in Portland Stone, in the art Deco Style. The recording studios, of which there were 22, were built into the central core and encased in brick, with no windows. This aided the soundproofing of the studios. Special sound-dampening ventilation shafts had to be installed to limit noise reduction during the recording process. In 2003 work began on a major refurbishment of the building. This was a result of the BBC trying to reduce its estates portfolio, by centralising many of its London services. It would take ten years for work to be completed. With construction completed, the building now houses all of the BBC News studios, BBC World Service and BBC Weather. There is also a Media Cafe, that overlooks the BBC Newsroom, and an exterior public piazza, directly outside of the studios for The One Show. Tours of the building saw over 100,000 people visiting New Broadcasting House. Unfortunately, tours are no longer available at New Broadcasting House, but tours of other BBC Buildings are still available.